Join the Mythgard Movie Club on April 18, 2019, for a discussion of Captive State, directed by Rupert Wyatt and starring John Goodman, Ashton Sanders and Jonathan Majors. Written by Rupert Wyatt and Erica Beeney, Captive State is a near-future science fiction film in which the Earth is overtaken, with the cooperation of world leaders, by an alien race (“the Legislators”) who establish “closed zones” in the hearts of major cities around the globe from which they rule. 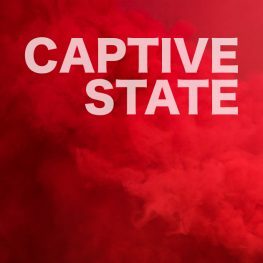 Set nine years after the initial invasion, Captive State follows the story of Gabriel Drummond (Sanders), a young man who lives in a poor Chicago neighborhood bordering the city’s closed zone. Gabe is haunted by both the memory of his older brother Rafe (Majors) – a freedom fighter who died in a famous attack against the Legislators and whose graffiti portrait appears throughout the city’s back alleys – and the attentions of Chicago PD Commander William Mulligan (Goodman), former partner to Gabe and Rafe’s father, who was killed while trying to help his family escape the city when the boys were young. Now, Gabe’s most pressing concern is collecting enough money to buy gas for a boat he restored with his best friend Jurgis (Machine Gun Kelly) so the two of them could escape, along with Gabe’s girlfriend (Madeline Brewer), across Lake Michigan. However, Gabe’s plans are diverted when he gets pulled into a rebellious plot by his brothers’ old acquaintances – who are of course being investigated by Commander Mulligan. The film makes liberal use of classic science fiction tropes around alien occupation, surveillance state technology and working class ingenuity – think Enemy of the State (1998) meets District 9 (2009) and Attack the Block (2011) [without the comedy]. Early reviews of the film are mixed, though many reviewers agree that the story is both ambitious and unexpected, with those who dislike it adding that the film’s failure is in execution rather than concept. Joe Leydon of Variety writes that Captive State “is liable to make its mark as an esteemed cult favorite rather than as a box-office blockbuster,” while io9 reviewer Germain Lussier says “Captive State has a lot of things going for it while also feeling like it could have been more” even though “the film’s third-act reveals bring it all together in a way that’s both incredibly satisfying and extremely layered.” Our own panel will discuss these and other aspects of the film when we get together to talk about this film that has flown under most people’s radars. Captive State was released in theaters on March 15, 2019. David Maddock is a software engineer by day and a MA student at Signum by night like a really nerdy, out-of-shape Batman who fights no crime. So, regular insomniac, I guess. Screen time ruins your circadian rhythm kids! Join the Mythgard Movie Club on April 18, 2019, at 8:30pm ET for a discussion on Captive State!